We will begin each day sitting together in the stillness of this remote jungle lake, as dawn slowly brings on the indescribable jungle chorus of cicadas and gibbons. Together, we will learn to cultivate seamless awareness in all sense fields, nourished by the dedicated cultivation of the 'divine abidings': unconditional friendliness, wise compassion, empathetic joy, and equanimity. In each moment of returning gently to the present, we develop the ability to abide with clarity and kindness in the midst of both subtle and strong emotions. 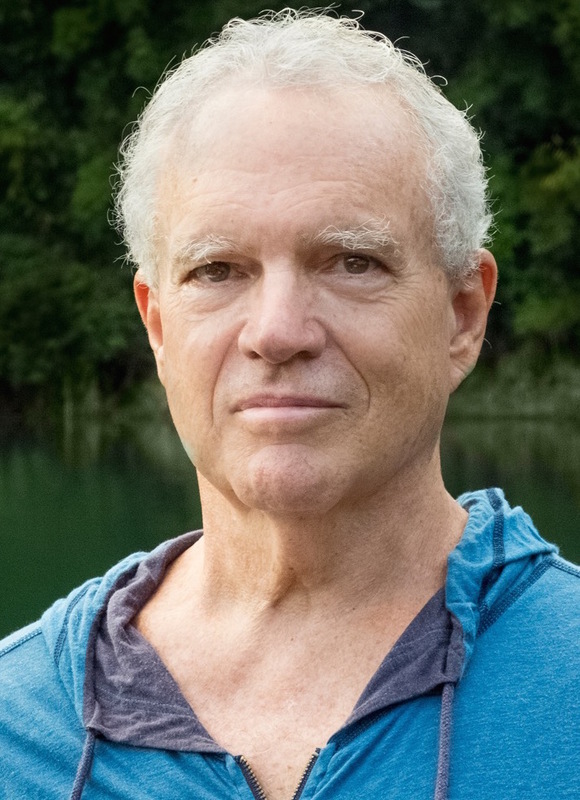 Steven V. Smith co-founded Vipassana Hawai’i in 1984 and in 1995 founded the MettaDana Project for educational and medical projects in Burma. Also in 1995 Steven helped establish the Kyaswa Valley Retreat Center in Burma, headed by Sayadaw U Lakkhana, Abbot of Kyaswa Monastery. This partnership helped usher in the beginnings of Vipassana Hawai’i’s Fusion Dhamma approach combining traditional and contemporary teaching styles in the same retreat. Anchored in the Theravadan Buddhist Burmese lineage of Mahasi Sayadaw since 1974, he was trained and sanctioned as a teacher by revered monk and meditation master Sayadaw U Pandita. Steven dedicates his time teaching Vipassana and the Divine Abodes (loving-kindness, compassion, joy, equanimity) in meditation retreats around the world. Cheow Lan is a remote, beautiful lake in the interior of Southern Thailand. 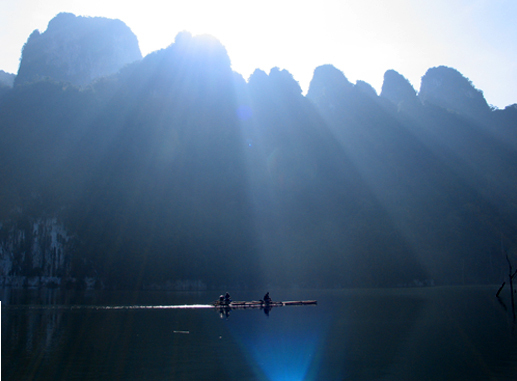 Located on the edge of Khao Sok National Park, the lake is hidden among towering limestone karst formations. The prehistoric jungle is part of a wildlife sanctuary that is home to gibbon apes, langur monkeys, giant hornbills, serpent eagles and many other rare birds and animals. 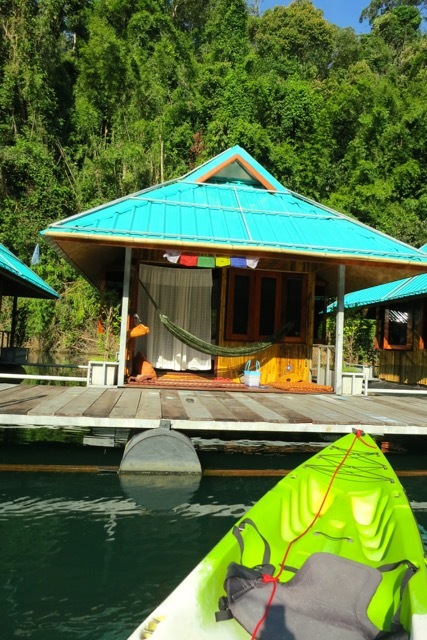 Accommodations are in private, comfortable floating bamboo jungalows/kutis . Linens, blankets, and towels are provided. The food is delicious and nutritious with wonderful fresh fruits and vegetables from the jungle and local markets, and fresh fish from the lake. Meals will be mainly vegetarian with fish and occasionally, chicken. Fresh drinking water is readily available. Lighting in the evening is provided by the moon and the stars. There is a small generator, usually on from 6:30 pm - 10 pm for lighting and outlets available for charging a few necessary electrical items. This is a rare opportunity to be unplugged with no Internet or telephone service available except for emergency use only. A $1300 USD registration fee will secure your place at the retreat, cover the costs of three meals per day, accommodation for 10 nights, transport to and from Surat Thani airport, as well as the travel costs of the teachers and support our scholarship program for future retreats. Dana: In keeping with the Buddhist practice of Dana (generosity), teachers are not paid through the registration funds. The teachings will be offered freely and donations to the teachers (in cash or online) are accepted and deeply appreciated by the teachers. There is no ATM or currency exchange at the pier or at the venue. Both are available at the Bangkok Airport. The Surat Thani airport is a last resort only - here there are ATM machines, but no currency exchange, and sometimes the group departure is delayed by yogis hassling with malfunctioning machines. Please try to prepare for your currency needs well before the travel dates and times. National Park entrance fee: Please pay 300 Thai baht (appx $10) at the booth near the pier, sign the entrance book for the park and keep your ticket stub. Other considerations for expenses are massage for 600 Baht (appx $18) per hour, a small shop offers comfortable clothing, and fresh coconuts and soft drinks will be available for purchase. We arrange a group pickup to and from Surat Thani airport. From Bangkok to Surat Thani is 1-hour flight. Arrival WE251 - BKK-URT departs 8:10 a.m. arrives 9:25 a.m.
Departure WE252 - URT-BKK departs 10:00 a.m. arrives 11:20 a.m.
Our group pickup will meet and drop off for these flights. The group transfer vehicle will be waiting for you at the airport to take you to the Chiew Lan Lake pier, a 1-hour drive. From the pier, there is a 30-minute boat ride across a phenomenal lake to reach Praiwan Raft House. Departure at the end of the retreat is early to get you back to the airport by 8.30am. You are welcome to book other airlines/ routes and to coordinate up with the group transfers pickup and drop-off point. Please discuss this with our registrar, who can send you all the information you need to make arrival and departure as smooth as possible. Because of the remote location of the site and infrequency of transfer options, make sure to plan all of your travel information with our registrar, who will also send you all the information you need to make arrival and departure as smooth as possible. Because of the remote location of the site and infrequency of transfer options, make sure to make your plans for arrival and departure in advance. For detailed information on the retreat, travel, and ANY questions you may have, please email our registrar. jake video 1080 from BodyMindEase on Vimeo. If you cancel more than 90 days prior to the retreat: We will refund all less $150 USD for administration and currency handling costs. If you cancel 89 days or less prior to the retreat: Retreat fees are non-refundable. Cancellation insurance is recommended. Cancellations affect retreat planning, are costly and sometimes mean that others cannot attend the retreat. If there are extreme circumstances and we have someone else to fill your spot at a sold-out retreat, we will consider your refund request on an individual basis.